New study finds a majority of Oregon farmers are nearing retirement age, and many don’t know who will take their place. Who will be the farmers and ranchers of tomorrow? 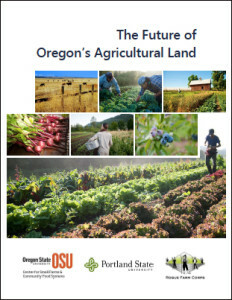 A new study looked at factors affecting “The Future of Oregon’s Agricultural Land.” The project, a collaboration among Oregon State University, Portland State University and Rogue Farm Corps, came to some concerning conclusions. First, the average age of Oregon farmers and ranchers is now 60 years. As these older farmers retire over the coming years, 10 million acres — 64 percent of Oregon’s agricultural land — stands to change hands. Problem is, there aren’t sufficient numbers of young farmers and ranchers willing and able to take control of these lands. The study showed a strong connection between the shortage of beginning farmers and ranchers (BFRs) and the rapidly rising cost of prime agricultural acreage in Oregon. “Land prices are escalating across the state, but especially in counties with a lot of nursery businesses which have irrigation and proximity to market channels,” said Nellie McAdams, one of the report’s co-authors. Jeff Stone, executive director of the Oregon Association of Nurseries, said there’s a trade-off when agricultural acreage is lost to development. McAdams pointed to land easements as one way agricultural Oregonians can preserve their state’s sustainability and agricultural heritage. Land easements allow landowners to sell farming rights to those who cannot afford to purchase the land outright. Unfortunately, many legacy farmers and ranchers haven’t fully planned for a new generation to steward their land into the future. 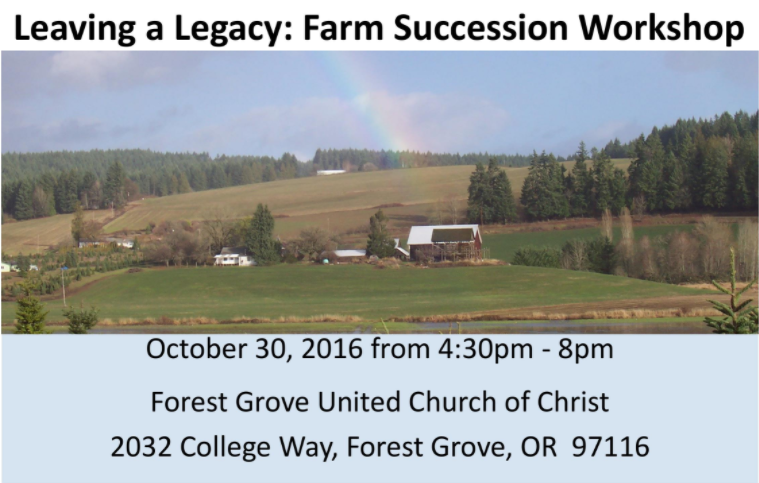 For those farmers and ranchers who don’t have a farm succession plan yet, Leaving a Legacy: Succession Planning Workshop will be held from 4:30–8 p.m. on Sunday, Oct. 30 at the Forest Grove United Church of Christ in Forest Grove. Estate attorney Joe Hobson and representatives from the Austin Family Business Program will give presentations, and a panel of farmers will talk about their experiences planning for succession. To RSVP, contact Nellie McAdams at 971-409-6806 or Nellie@roguefarmcorps.org.